Residing under the umbrella term of ‘material extrusion’, semi-solid extrusion (SSE) 3D printing deposits gels or pastes in sequential layers to create a solid object. The physical nature of the feedstock allows SSE to print quickly at low temperatures with little compromise in accuracy. As a result, the technology has been extensively adopted in the field of bioprinting in which SSE can print living cells able to create large, complex structures of human tissue. In terms of pharmaceutical formulation, SSE is relatively unused. By building on the advancements made in other fields, the unique attributes of SSE printing are beginning to come to the fore. In particular, the ability of SSE to create complex tablets at a low heat means the technology has the potential to make on demand, personalised dosages within a clinical setting. As a result, the infancy of SSE in pharmaceutics should not be seen as a sign of inferiority but rather a real opportunity to bring 3D printing into the clinic. Fussell S. This company is creating incredible 3D printed food you can eat. Business Insider. 2016. Available from: http://uk.businessinsider.com/3d-printed-food-foodini-2016-4?r=US&IR=T. Awad A, Trenfield SJ, Goyanes A, Gaisford S, Basit AW. Reshaping drug development using 3D printing. Drug Discov Today. 2018; https://doi.org/10.1016/j.drudis.2018.05.025. 3DDiscovery: RegenHU. 2017. Available from: https://www.regenhu.com/. 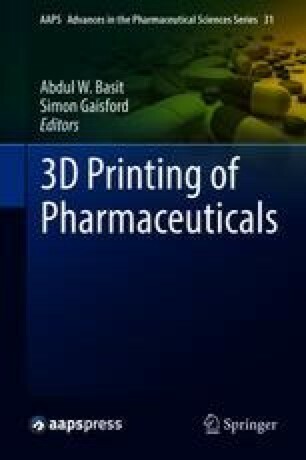 Critchley L. 3D Bio-printing approaches for tissue engineering applications; 2017. Available from: http://www.azom.com/article.aspx?ArticleID=13810. Wyman C. New stratasys 3D printers expand digital dentistry with low cost, highly accurate wax-ups. Strasys Blog. 2014. Available from: http://blog.stratasys.com/2014/05/13/crownworx-frameworx-dental-3d-printers/. Magic Candy Factory. Magic Candy Factory Katjes; 2017. Available from: http://magiccandyfactory.com. Medical Devices Quality System Regulation. 2017. Available from: https://www.fda.gov/MedicalDevices/DeviceRegulationandGuidance/PostmarketRequirements/QualitySystemsRegulations/default.htm. U.S. Food and Drug Administration. Technical considerations for additive manufactured devices. Draft guidance for industry and Food and Drug Administration staff. 2016. Available from: https://www.fda.gov/downloads/MedicalDevices/DeviceRegulationandGuidance/GuidanceDocuments/UCM499809.pdf.